A grater makes some onerous cooking tasks shockingly easy. Here’s a guide to some of the surprising things these multitasking gadgets can do, with recipes to match. 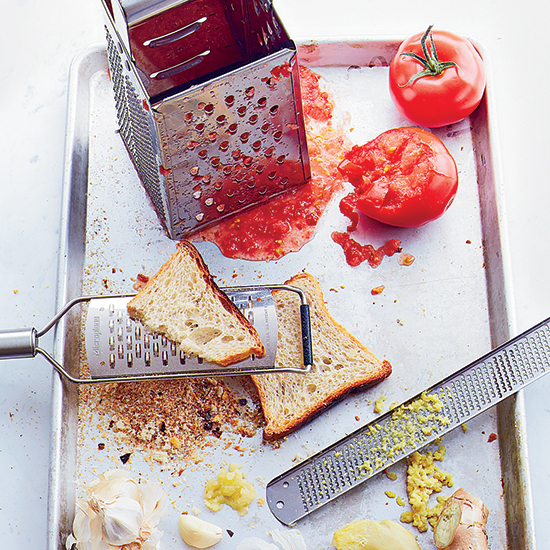 Most cooks own a basic box grater and a Microplane (or two). Here’s a guide to some of the surprising things these multitasking gadgets can do, with recipes to match. This handy little grater has small, sharp slits that cut in both directions, making it excellent for thinly shaving chocolate or cheese. A coarse Microplane is also good for making bread crumbs to top grilled vegetables or steaming bowls of pasta. The broad work surface and large, sharp holes can quickly shred cheddar cheese and firm vegetables like cabbage and carrots. A less obvious use is pureeing corn kernels from a shucked ear and squishy vegetables like tomatoes (leaving the thin skin behind). Its tiny, ultra-sharp holes famously allow the Microplane to scrape the zest from citrus without cutting into the pith beneath. The Microplane can also quickly puree small, soft aromatics like garlic and ginger, or grate whole spices like cinnamon sticks and nutmeg. In a bowl, grate 1 1/2 pounds ripe tomatoes on the large holes of a box grater until only the skin remains; discard the skin. Cook 1/2 cup chopped onion in 1 tsp. oil until softened. Add 1/4 cup turbinado sugar, 1 tablespoon cider vinegar and the tomato pulp. Cook, stirring, until thick. Add 1 1/2 teaspoon lime juice; season with salt and pepper. Serve with grilled chicken. Makes 3/4 cup. Brush 1 thick slice of day-old country bread with olive oil and toast until golden. Rub all over with 1 cut garlic clove; let cool. Using a coarse Microplane, grate the bread into crumbs and serve sprinkled over 1 1/2 pounds grilled sliced zucchini that’s been drizzled with fresh lemon juice and grated Parmigiano-Reggiano. Makes about 3/4 cup of crumbs. Working over a bowl, grate 4 just-shucked ears of fresh sweet corn on the large holes of a grater; discard the corn cobs. Stir 1/2 cup minced parsley, 1 tablespoon each of minced shallot and fresh lemon juice, 1 finely grated small garlic clove and 1/4 cup olive oil into the corn puree and season with salt and pepper. Serve with grilled shrimp. Makes 1 cup.